While walking home I came across a snail 3 times the size of a regular snail. 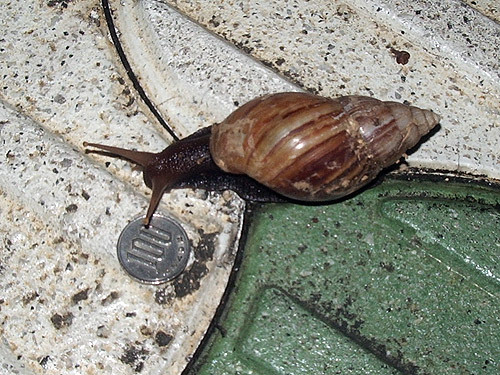 It was the biggest snail I have ever seen… well the banana slug is not really a snail. While taking a picture of it a passing school girl stopped to warn me not to touch it. They can contain some kind of parasite that goes to your brain. This week on Tuesday I meet a friend who lived with me in Big World 21. 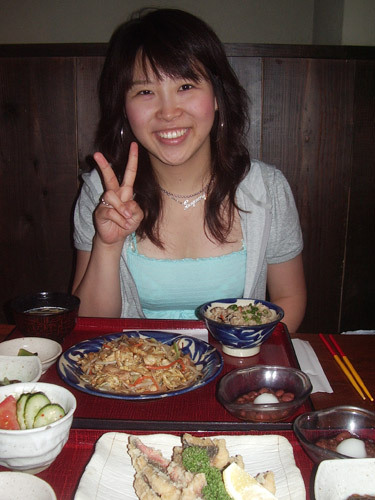 She was taking a short vacation in Okinawa and before leaving wanted to have lunch with me. We went to a nice Okinawan food restaurant. It was nice to see someone from Tokyo again, and get all the latest news from that part of Japan. One of my coworkers bought a Wii a while ago, but really doesn’t play it that much so has been lending it out to other people at the office. Since my knees have gone bad, I figured it would be the perfect time to borrow it. 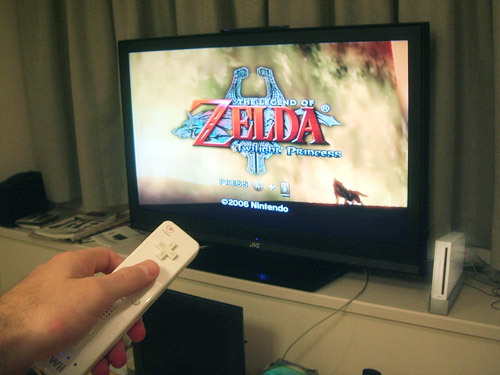 I began playing the new Zelda game and hope to beat it, but I will do it all in Japanese! Talking to all the people in the game, reading all the kanji, and figuring out what what I am supposed to do is half the challenge in itself. Yet, I am surprised how much I know. I really havent even had to look many words up yet. Oh, and playing on the big TV is absolutely great! Very close to my work place a new shop opened up. 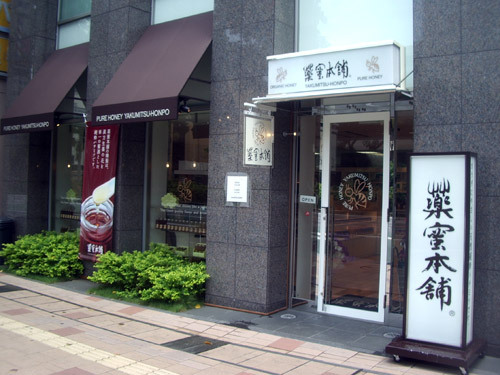 It is a store specializing in different kinds of natural honey. There is also a small cafe inside as well that serves lunch. The lunch and the honey are both super expensive, but that didnt stop me from going there. I went with one of my coworkers, and we got the lunch curry. The lunch was as follows: first we got little trays of different kinds of honey to sample, second a salad with some kind of honey dressing, next the curry and instead of rice we got wheat pancakes. We also got more honey to put in the curry to counteract the spiciness and to dip the pancakes in. Last came the tea with even more honey to put in the tea. Finally, as you are paying you can get samples of the other kind of the expensive honey they have for sale. I guess when my still full $2 bear-shaped bottle of honey is gone I might possibly get some honey from there, or maybe just another $2 one. Too much exercise and sports? I didn’t even know there was such a thing. Recently I found a group to play futsal (5 on 5 soccer) with. I really enjoy playing futsal too. The court is smaller so there is a lot more action. Besides that, I joined the basketball club at work. It has been such a long time since I have played basketball. I think I forgot how to shoot the ball. That was always my weak point, though I can still steal the ball really well. Above all that, I have been spending most of my weekends riding around up and down hills on the bicycle. Is that really too much? Now my knees hurt. I don’t know exactly what is wrong with them, but they feel really strange. It is almost as if I can feel the bones rubbing together. I’m still only 25, so why is it that my knees are already bad? For now I am trying to take it easy, but not moving and staying inside is really difficult for me… I need to be active. A high definition flat panel TV. 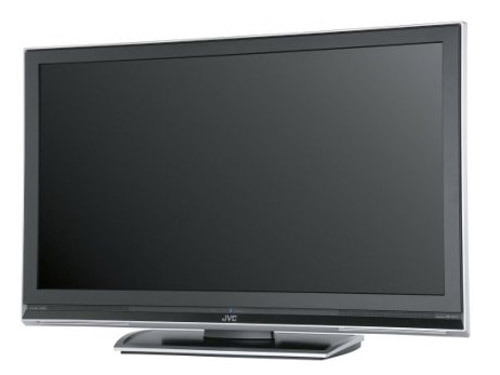 It’s a full 46 inches with 1080p resolution. No more watching movies on a tiny computer monitor. I will not mention the price though.